Each cochlea is represented bilaterally however, cortical response is greatest contralaterally. Otosclerosis – most common adult cause of hearing loss. Autosomal dominant genetic disorder Characterized by fusion of stapes to oval window causing difficulty of movement followed by eventual cessation of ear ossicle movement. It is amenable to surgery. Persistent loud noises can cause cells to die (frequency dependent). Infection Viruses e.g. mumps. 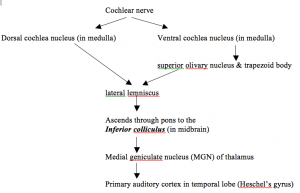 German measles during pregnancy can cause complete destruction of cochlear nerve in fetus. Middle ear infections e.g. Otitis media – bacterial infection causing swelling and outward bulging of tympanic membrane, pain and pus collection in middle ear. Most common in children as eustachian tubes are not fully formed and thus don’t drain well into nasopharynx.